According to new poll by Gallup, 72% of Americans say "big government is a greater threat to the U.S. in the future than is big business or big labor, a record high in the nearly 50-year history of this question." A poll by Washington Post-ABC News reports that 72% of those who disapprove of President Obama's job performance, say that they would vote for the GOP candidate for U.S. House in their district if the election were held today, while just 14% say they'd vote for the Democrat. A new poll by the USA Today/Pew Research reports that just 45% of 18- to 29-year-old Americans approve of the way President Obama is handling his job; 46% disapprove. The survey notes that "the president's approval rating with young Americans -- which stood at 67% just ahead of his second inauguration less than a year ago -- now mirrors the general population." According to a new poll by Quinnipiac, Republicans lead in the generic congressional ballot--by 41% to 38%--the first time they have led all year. Despite signs that aspects of the economy may be improving, a New York Times poll reports that "37% of those surveyed approve of Obama's handling of the economy; 58% disapprove. These numbers are indistinguishable from the results of a CBS News poll taken last month, although better-than-expected unemployment numbers and other positive economic data were released last week." 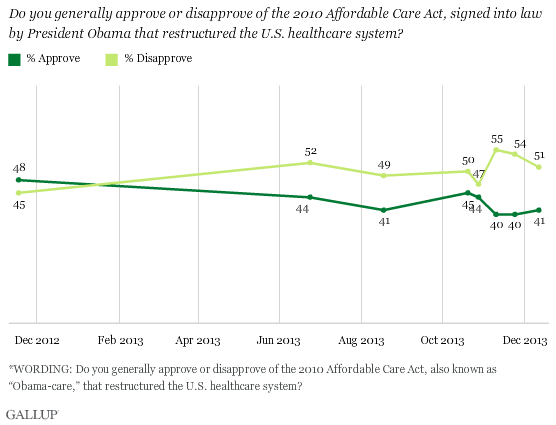 Obama Approval Drops To New Low, Or Does It? According to a new Quinnipiac poll, President Obama's job approval among American voters has dropped to a new low, a negative 38% to 57%. But a new poll by Pew Research reports a different outcome, with the President's approval rising slightly to 45% to 49%, reversing a six-month slide. According to a new survey by Gallup, the vast majority of Americans, 69%, say the health care law, "so far, has not had an effect on them and their family, similar to what Gallup measured more than a year ago. More Americans say the law has hurt (19%) rather than helped (9%) their family, a slightly larger gap than was found last year." According to the latest Economist/YouGov Poll, only 6% Americans approve of the job the US Congress is doing, but are evenly split in their opinion of the so-called “nuclear option,” which effectively ended the rule that allowed filibusters on Presidential nominations, after Republicans used the threat of a filibuster to block multiple nominations: 36% approve of changing the number of votes required to break filibusters to 51, so bills could pass by a simple majority; 37% disapprove. A new poll by Harvard Institute of Politics of 18 to 29-years old voters reports that 52% would vote to recall President Obama. A new survey by Quinnipiac in reports that GOP Gov. Rick Scott rails former GOP Gov. Charlie Crist, now an independent, by seven points in his 2014 re-election bid, 47% to 40%.